Over 250,000 elders are abused in California each year, yet less than 1 in 6 incidences are reported. You might be surprised to learn what elder abuse is, and how to spot the sometimes subtle signs. And you may learn that you are a mandatory reporter, and what happens if you don’t report suspected elder abuse. Finally, you’ll hear of an actual elder abuse case with a “rest of the story” that will leave you speechless. 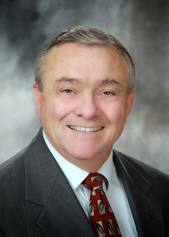 Our presentation will be done by Roy N. Johnson, Attorney at Law. Roy is a partner of our very own Ryan Thomas. Pres. Peggy welcomed us to the finest club in District 5130. The Pledge of Allegiance was led by Bill Rousseau and the Invocation was a beautiful “Rotary Moment” from Paul Harris given by Debi Zaft. None could be found by Ryan Thomas. Steve Olson introduced the John Brown scholarship winner, Ashley Reseke, who came with her mother and boyfriend. He also introduced the Stan Lance scholarship winner, Christopher Sharp, who was there with his mother. Jack Lance represented the Lance family. Doug Johnson introduced our speaker, Nicole Vice from REACH for Life. Yale Abrams introduced Wes Winter, Executive Director of the Family Justice Center. Penny Tibbets announced that Ed Anderson’s wife is sick. Genie Delles is stabilizing and will not be needing a bone marrow transplant. After the meeting, your editor was told by Fr. Matt Lawrence that Nick Knickerbocker’s wife, Camille, is in the hospital and not doing very well. Prayers are requested. Doug Roberts announced that there was $211 in the pot. The lucky number belonged to Wes Winter, Yale’s guest, who drew the Ace of spades and not the Queen of diamonds; so he walked away with $10. Steve Olson presented the Stan Lance Scholarship award to Christopher Sharp, owner of a 3.69 GPA at Santa Rosa high school, President of the local Future Farmers of America, a volunteer for the Salvation Army, the local food bank, the secret Santa program, and the proud owner of a champion hog. The John Brown Scholarship went to Ashley Reseke, an Army veteran who served from 2003 to 2009 as a combat medic with the 82nd Airborne. She spent 15 months in Iraq and was also deployed to New Orleans after Hurricane Katrina. She attended Montgomery High School where she has earned a 3.58 GPA. Her intention is to attend the nursing program at the JC and eventually transfer to the nursing program at Sonoma State. This year’s scholarship is being funded by both Wayne Rowlands and Vicki Hardcastle to the tune of $2000. John McHugh gave a presentation on the ongoing efforts to create a legacy project for the club. John explained what he wants by reference to a Press Democrat article from earlier this week about the Sebastopol Rotary’s swim program, which has been going on for 30 years now and has helped hundreds of children in the West County learn to swim. Every parent of a second grader in Sebastopol knows that Rotary sponsors this program. John explained that if we come up with a similar legacy project, it will not only help us engage with the community, but it will help our membership efforts. John has an ad hoc committee, which is open to anyone who wants to join. On April 14, the group will be meeting at noon at Carmen Sinigiani’s office to take a field trip to the Baylor Park and Gardens in the Roseland area, to see if they can come up with a legacy project centered around that facility. The hope is to have a legacy project that has something to do both with our youth and education. What it has been: the District’s five most recent past District Governors make up the nominating committee for District Gov. Nominee. This is in accordance with the Rotary International bylaws and has been effective since the District was established. The issue: when the District Gov. 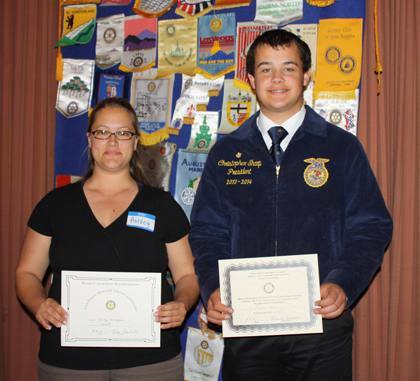 Nominee was elected from the Calistoga Rotary club for 2010 – 11 and then again for 2014 – 15, some clubs did not think the selection process was fair. When there were two district governor nominees coming from the same club they thought the process ought to provide broader representation. What is proposed: a mix of current and incoming District Governors, recent past District Governors, and at large members from randomly selected clubs make up the selection committee. The belief is that a larger committee will ensure that those officers with the most current knowledge of the district’s clubs and their concerns will have input. It will also increase the transparency and accountability of the process. Each club will vote on this and it will be settled at the District Conference in May. We will have copies of the two opposing sides on the tables next week and will have a short discussion on it before we vote on it. The two opposing sides will also be sent out to you by e-mail. Pres. 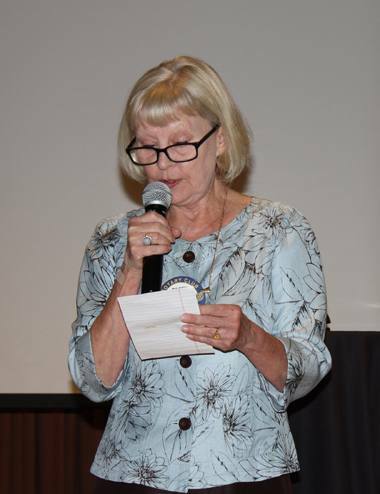 Peggy announced the loss of a few Rotarians: we lost Dan Walker, who has been commuting from San Rafael, but who is willing to still help out with Giro Bello. We lost Jason Black to his workload, and we also lost Katie Barr, who has now switched to the Santa Rosa West Club, which fits her schedule better. Cathy Vicini reminded us of our April 23 event, which will be in the evening. Donation items are needed! Tim Delaney had two announcements: there will be a World Community Service meeting at Rick Allen’s house on Monday at 5 PM; and Tim is donating a flight to be auctioned off at the April 23 event, which will go over Point Reyes, the Golden Gate Bridge, with lunch at Half Moon Bay. The minimum bid will be $500; Tim can accommodate you and 2 of your friends. Bill Rousseau asked for volunteers for the Debunking Committee; Peggy’s debunking will be on June 25. Debi Zaft urged all members to read the Rotarian magazine and sign the 100% readership paperwork, which is on the table at the entrance. Eileen Carlisle announced the election to the Board of Trustees of the Foundation of Wayne Rowlands, Cathy Vicini and John Poremba. Eileen also mentioned that the foundation has $1.2 million in funds. The Sonoma County Area Rotary Clubs (SCARC) monthly meeting information is available for all club members. Attending will be your own expense. Please RSVP to the hosting club by April 22nd as requested. You can view the flier here: http://www.santarosarotary.com/wp-content/uploads/2014/04/April-2014-SCARC-Flyer.pdf. 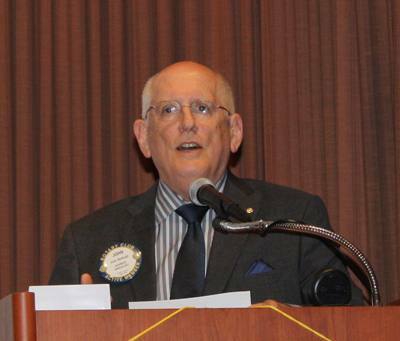 Ray Giampaoli, who is heading up the Sponsorship Committee for the Giro Bello, asked for volunteers to go to other Rotary clubs in the area to pitch sponsorship opportunities to the members of those clubs. See Ray if you’re willing and able to help out. Don McMillan is once again looking for volunteers for the Giro Bello to work on Friday and Saturday setting up and cleaning up. Don will be leading some volunteers to San Rafael to pass out flyers on April 27 and some of our members will be helping out with the Petaluma ride on May 17. We have traditionally helped out with their ride and they then reciprocate and help out with our ride, so we’d like as many people to volunteer for this is possible. Pres. Peggy also announced that Gerard’s is donating a catered dinner for eight at the April 23 event. If you win this item, all you have to do is set your table. Gerard will come and cook your dinner and clean up everything afterwards. Sounds yummy! Doug Johnson introduced Nicole Vice from REACH, the local helicopter ambulance service. REACH is a Bronze Sponsor of the Giro Bello. Nicole Vice is the sales manager for Mendocino County, Lake County and Sonoma County. She gave a brief overview of the history of REACH. REACH was founded by Dr. McDonald in 1987. Dr. McDonald is the physician who opened the Emergency Room at Santa Rosa Memorial Hospital; Dr. McDonald is also the physician who started the first paramedic program in Sonoma County. In 2000, Santa Rosa Memorial Hospital achieved the designation as a Level II Trauma Center, a significant achievement. In 1993 Children’s Hospital of Oakland chose REACH as its preferred air ambulance service. In 2012, REACH was acquired by Air Medical Group Holdings so REACH is now part of a network that covers 30 states. REACH has 11 bases in California, as well as bases in Oregon and Texas. 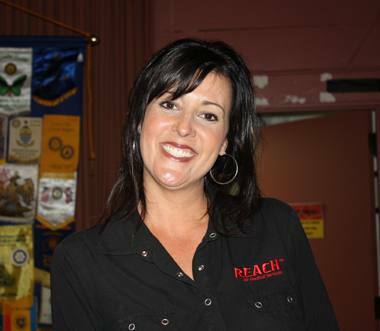 REACH has a membership program, which costs $65 per year. Your membership covers you and anyone who lives in your household. If you become a member, REACH will cover whatever your insurance does not cover, which can be a significant savings. Nicole indicated that a typical air ambulance bill is in the range of $20,000-$50,000. If your deductible is 20%, that can mean a bill to you of $10,000. If you’re a member of REACH, you don’t have to pay anything. Further, you don’t have to have health insurance to become a member. Nicole indicated that a lot of their customers are bicyclists. Nicole bragged about the great pilots that work for REACH, many of whom are retired Coast Guard pilots. REACH has a dispatch center in Santa Rosa, and calls come in typically from fire department personnel, the police, and hospitals.